Escape quarantined orbital platform by overcoming system malfunctions and completing half-built spaceship, in a quick cooperative card game Assembly by Wren Games. 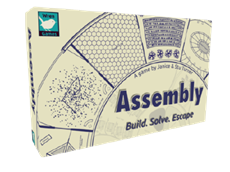 Assembly is a cooperative or solo puzzle card game. Using the Command Cards in your hand Draw, Swap, and Rotate Room Modules around the ship until they sit on their matching Blueprint where you can lock them into place to build a ship and escape. You can support the game's first physical release by pledging to the ongoing Kickstarter campaign.